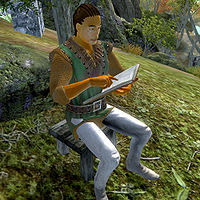 Pyke is a Redguard knight living in the settlement of Hale. He is a Knight of the Thorn who entered the Shivering Isles and lost his Knights of the Thorn Medallion to some Grummites. Pyke asks you to retrieve this for him. Pyke lives a contented life in the realm of Madness with his fiancée Zoe Malene. He sleeps in the double bed of her house between midnight and 6am. When the couple awaken they enjoy a four-hour breakfast downstairs, before Zoe exits the house to paint. Pyke will follow his lover outside, where he will pose in front of her easel while reading a book. At 4pm, Pyke and Zoe retreat back inside the house, where they both stroll around sweet-talking for four hours until Pyke sits down for dinner at 8pm. After a four-hour meal, which he eats alone, he will follow Zoe up to bed at midnight. Pyke wears the rare forester's shirt, grey trousers and a pair of brown loafers. He is armed with a leveled blade and carries the book Guide to Cheydinhal, his house key, a cheese wedge and a large amount of gold. When you arrive in Hale, approaching Pyke's girlfriend Zoe Malene will result in the following plea: "If you could help Pyke, I think you'd make him very happy. I've grown quite fond of him and can't stand seeing him this way. I'm still working up the nerve to paint his portrait, but I'd rather do it when he's back to his happier self." When Pyke sees you he will greet you briefly, saying; "Good day to you." When you start a conversation, he will request that you help him recover his lost medallion; "It's good to meet you. The name's Pyke, and I welcome you to my humble home. Please, make yourself comfortable. Since you're here, I was wondering... do you think you could assist me? I'm having a bit of a crisis." Speaking to him again before agreeing to help him recover his medallion will have him remind you of his problem: "I hope you can help me with my crisis." If you ask him about his crisis he will reply; "Well... this is a bit embarrassing, so forgive me... I was a Knight of the Thorn from Cyrodiil. As soon as I heard the gates to the Shivering Isles opened, I knew a threat was lurking inside. I made my way here and began exploring this strange place. As I was passing Fetid Grove, I was waylaid. Some dastardly Grummites stole my most prized possession... my Medallion that signified my membership in the Knights." When you question his status as a knight, Pyke will explain: "Yes, I admit that being a Knight of the Thorn no longer holds any interest for me. I've found a new kind of comforting inner peace here away from the chaos of Cyrodiil. I'm tired of the battles and the politics. But most importantly, I've met the woman of my dreams. If I had to leave Zoe, I think I'd be the loneliest man alive. So you see, everything I want is right here in this beautiful place." He will then explain the sentimental value of the medallion: "Even though I never intend to be a Knight again, that Medallion represents an important part of my past. It's the only piece of my history that validates who I am. Anyway, enough of my banter. So, will you please help me get back my Medallion?" "If you're ever in Cheydinhal, be sure and look us up." You will either have the option to accept the quest or deny his request. If you choose to not take up this quest at this time he will be disappointed; "Well, fine. I see that only true Knights understand the meaning of honor. Good day." Asking him about his crisis again after denying it the first time will have him ask; "Changed your mind?" After which you will be given the same options as last time, and the same potential results for both choices. At this point, before accepting the quest, you can also ask him about the Medallion; "It's a small, round, gold medallion. On the back is the inscription "To Pyke, from Farwil"." If you choose to travel to Fetid Grove to retrieve the medallion he will be slightly surprised that you would take up this quest, but nonetheless happy that you did: "Fantastic! I will mark Fetid Grove on your map. Good luck to you, friend!" Asking him about his medallion after accepting his quest will have him hope that you managed to retrieve the medallion; "I hope you're back with some good news, I could certainly use it." Asking him about the Knights of the Thorn will make him explain: "Yes, we are based out of Cheydinhal. Our leader, Farwil Indarys, is the son of the Count of Cheydinhal, Andel Indarys. As Farwil is fond of saying, "We strike fast and true as lightning." He tends to overstate things a bit, but he means well. If you're ever in Cheydinhal, be sure and look us up. We have a lodge just outside the City Gates." When you end a conversation with Pyke after accepting his quest he will part ways with you by saying; "Be cautious, my friend." Speaking to Pyke again before traveling to Fetid Grove will have him greet you by saying; "Fetid Grove is a dangerous place... please be cautious." When he sees you after your visit to Fetid Grove he will say: "Welcome back, my friend." Speaking to him at this point, whether you have the medallion or not, will cause him to anxiously ask; "Any word on my Medallion?" Asking him about the medallion after successfully retrieving it will have him thank you for recovering it, and then giving it to you as a reward: "Wait a moment... if you'll pardon my manners, you reek of the bogs. You must have been to the Fetid Grove! My Medallion! I don't know how to thank you! I have decided to stay here in the Shivering Isles. I've found peace here, and I see no reason to return. Therefore, I'll not be needing this anymore. Please, take it as a reward." Speaking to Pyke again once you have completed his quest will have him remark; "Another fine day in Mania, is it not?" and immediately end the conversation. Zoe Malene will also be quite happy and give you credit for Pyke's good mood: "Thanks again for bringing Pyke back his Medallion! I've never seen him so full of happiness." As a former Knight of the Thorn, Pyke is a popular conversation topic all over the Isles. When asked for rumors or during random conversations, citizens will say: "I understand there's a Knight of the Thorn in Hale. ", "If you visit Hale, you may see Pyke, a Knight of the Thorn." and "Pyke, the Knight of the Thorn, lives in Hale." Others will mention his relationship with Zoe Malene: "I heard he lives with Zoe Malene. ", "He's been living with Zoe Malene, looking for some amulet." and "I understand he lives with Zoe Malene." In Hale, Pyke's poet neighbor, Halion, will share a few verses about him: "Pyke has a new love in Hale, a woman named Zoe Malene. Will they ever find true happiness and, if so, until when?" and "If your journey takes you to the settlement Hale be sure to speak with Pyke. He is a most unusual knight, whose story you might like." Meanwhile, in Split, the demented Atrabhi will mischievously tell you: "If you visit Hale, you won't see Pyke, a Knight of the Thorn. In fact, there is no such thing as a Knight of the Thorn." and "He definitely doesn't live with Zoe Malene." To Help A Hero: Retrieve the stolen medallion of a Knight of the Thorn. He is one of the few people in the Shivering Isles who is not crazy, insane, or anything of the sort. This page was last modified on 22 June 2018, at 04:48.